The scoreline wouldn’t have surprised many people but how it came about is another thing. If Newcastle’s players had pressurised Southampton as much as they did Stoke, we wouldn’t have visited here on the back of a losing run. The question is whether you pat the players on the back for the first eighty minutes, or have a go because of the last ten? The application of the players was first class and exemplified in the unexpected figure of Vurnon Anita who never stopped running. The whole team made the home side play early balls instead of letting them have comfortable possession and load the dangerous areas. It wasn’t pretty but Newcastle reached halfway after relatively few scares, the home side having a few set-piece (no surprise) situations that Newcastle managed to deal with one way or another. Watching Stoke every week would do your head in and the crowd figure of twenty six thousand would suggest many of the locals feel the same way. 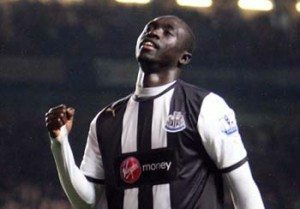 A few minutes into the second half and Cheick Tiote dispossesses an opponent high up the pitch, he feeds Demba Ba whose shot isn’t held and it is one-nil as Papiss Cisse follows up with an excellent finish from a very tight angle. Stoke then huffed and puffed but never looked like blowing anything down, let alone our lead. Then just as you started to count the clock down, disaster struck. Newcastle had seen off the home side’s most constructive players as both Charlie Adam and Matthew Etherington were dragged off but the final cruelty was yet to come. A bog standard cross from the right was headed in by Walters with Williamson flat-footed, surely the least we deserved was a point? Five minutes left and a long ball is headed (unopposed) by Kenwyne Jones to the feet of Jerome with Coloccini half asleep. That’s 2-1 and I feel desperately for the players as I feel they gave it everything they had and didn’t deserve this. Newcastle rediscovered a bit of pride and self-belief tonight but no points. Buy a copy of the new issue of our magazine for only £3 online HERE, it includes interviews with Ryan Taylor and Supermac as well as all the usual features and columnists. You can also buy Subscriptions online HERE, prices starting from £23, the perfect Christmas present.